Tottenham cake was one of the stars of this week’s Great British Bake Off. 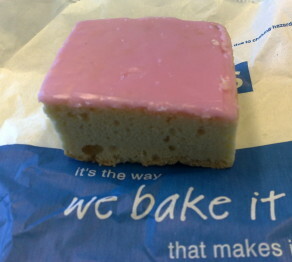 For anyone unaware of this local delicacy, it is type of tray-baked sponge cake topped with pink icing. It was originally produced by a local baker, the Quaker Henry Chalkley and sold for one old penny per slice, with offcuts only a half penny. The pink colouring reportedly stems from the use of mulberries which grew in the garden of the Tottenham Friends Meeting House. In 1901 free slices of the cake were distributed to local children in celebration of Spurs’ historic FA Cup victory. It is still baked by local Quakers and is also available in near-by bakers. To achieve a flat-top cake, cover with foil. This is either lurid pink or shocking pink. This entry was posted in Food and tagged Quaker, Tottenham Cake on September 21, 2013 by admin. Hello, I just wanted to send you an email regarding the Tottenham cake. Our family has recently been looking into our family tree and we have found out that my great grandfather was Henry Chalkley. This has been a great finding as my 8 year old son is an avid Tottenham Fan with Harry Kane being his hero. I wondered if you had any more information and where we could take my son to buy some. Hello, if you don’t fancy baking one yourself, I think you can buy Tottenham Cake in most London branches of Greggs, even the Highbury one!